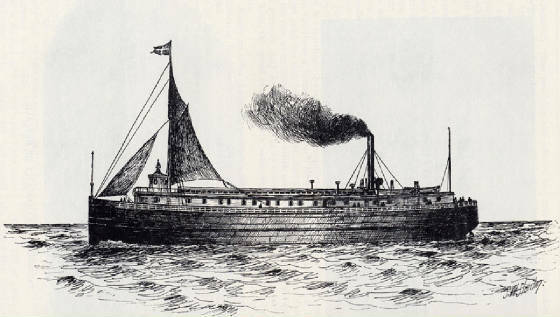 The Merchant was the first iron hulled vessel to enter commercial and passenger service on the Great Lakes. The 230-foot steamer was built in 1862, the same year that the burned Confederate Steamship Merrimac was plated with iron and converted into the first iron hulled naval ship Virginia in the Civil War. The Merchant, owned by the Anchor Line, seemed to be a hard-luck ship. Like the Virginia, it had a wooden hull plated with iron. This apparently made the vessel heavier than other vessels on the lakes, and consequently it could not go where other ships went. It was always stranding. It sank twice near Malden, Ontario in 1868 and in 1872. It stranded three times on Racine Reef, off Racine, Wisconsin. The third time, in 1875 marked the end of the Merchant. It thus holds the honor of being the first iron clad ship to sink on the Great Lakes. The Merchant was laden with 30,000 bushels of corn and 1,300 barrels of flour. The mate was standing watch when the vessel struck the reef while running at top speed. The impact tore the bottom out of the steamer. One of the sinkings near Malden, on the Detroit River, proved to be an especially difficult salvage job. It struck a rock on May 20, 1872 and sank to its main deck. The ship was carrying railroad iron and general merchandise. After the cargo was removed, it took four salvage tugs, four large pontoons and five portable steam powered pumps positioned on the main deck to lift the hull high enough off the bottom so it could be towed up river to Detroit dry dock. The vessel had two holes in its hull, one of them 23-feet long.